Rosemary Hayes has kindly written us another piece that helps explain the lives of women writers. In fact, Rosemary kindly wrote it for me last year, following last year’s theme, but last year I was not-quite-well and this year it works wonderfully to help us understand a more complex picture. I’m not by nature a joiner of groups but I am very glad I overcame my reluctance and signed up to two or three authors’ societies. One of the best things about being part of a network of writers is the support, encouragement and advice you get from colleagues when things aren’t going so well. Yes, it is great to share successes, but in my view, even more valuable to share the failures, the bad times, when your confidence is so shattered that you can’t believe you were ever arrogant enough to call yourself a writer. Knowing that you are not alone, that all writers, however apparently successful, have been through these experiences, can be the only thing that keeps you going and spurs you on to dig yourself out of that deep hole of waning self confidence. There have always been blips in my writing life. It had begun so well and, initially, been so easy. I had written an historical novel with a twist of fantasy; a story I really wanted to tell and believed in, which had been brewing in my imagination for years. I’d put it away for long periods and then taken out again, tinkered with it, asked others to read it, incorporated their advice. And then, finally, entered it in a national competition here in the UK, after which I forgot about it again and got on with my life, looking after my three children and an assortment of animals, working part time, doing voluntary stuff, visiting aging parents, coping for long periods on my own while my husband worked abroad. Okay, so that’s what women do at these busy times in our lives. We multitask, switching priorities when we have to, juggling, keeping all the balls in the air and, if we are lucky, managing to fit a little time into our lives to indulge in our hobbies. And, back then, I did see writing as no more than a hobby. Having written my novel I felt that I had, at least, achieved what I set out to do and if it never saw the light of day, never got to be read by anyone except family and friends, then too bad. At the time, I knew nothing about the publishing process, about agents or editors. I was impossibly green. It was only much later, when I went to work for a large publisher, that I realized how lucky I had been. The national competition was run jointly by a well known publisher and the Book Trust and the results weren’t announced until months later. I had genuinely forgotten about it when, to my astonishment, I heard that my story was runner up in the competition and that it would be published. These were the good times. I worked with a brilliant editor who taught me so much and helped me fine tune my work. Four more books were commissioned and I began to believe that I was a ‘proper’ writer. But then the editor in question went on to higher things and, as so often happens, the new editor didn’t particularly like my work, was looking for new voices, and no more commissions came my way. That was my first time in the wilderness and there was a long gap before I was taken on by Penguin Australia and had a very happy relationship with them, writing many books over a period of about eight years. Three of these were historical novels, all based on events in Australia’s history, with which I have a particular fascination (more of this later). Then again, the wonderful editor with whom I had worked moved on, my ideas for new books weren’t accepted, the work dried up and no other publisher showed any inclination to take me on. At these points in your writing life, unless you have incredible self-belief, it is very easy to lose faith in yourself as a writer. Even though, by that time, I had a bunch of published books to my name, it made no difference. A lot of navel searching went on. I had no background as an historian, so maybe I should never have attempted to write historical novels. But even at this low point, some of these events from the past just wouldn’t let me go and I continued to mull over ideas, do research, jot down plot structures. A couple of years went by when neither agents nor publishers seemed interested in my proposals and then, just at the point when I was ready to abandon my writing, a commission came from Hachette for a trilogy of historical novels – a family saga, this time, from early Victorian times to the second World War. Although the stories were essentially about an English family and their triumphs and tragedies, an Australian thread sneaked into them (transportation for a petty crime, the gold rush). But they didn’t sell particularly well and, although the editorial team wanted more from me, marketing and sales felt the books’ sales didn’t justify further commissions. This was when I became aware of a shift in emphasis from publishers. Editors’ enthusiasm for a wonderful story, a great idea, frequently had cold water poured upon them by the sales and marketing departments and by the accountants who, as larger publishers gobbled up the smaller publishers, became more and more influential, their eyes always on the bottom line of the balance sheet. Editorial had to go through endless hoops to commission books and often a quirky, original idea that had so grabbed an editor, failed to pass the scrutiny of those looking for a ready market and guaranteed sales. Or, if it did, it became so diluted as to be unrecognizable. Those Hachette books were the last ones for which I received an advance based on a first chapter and a synopsis. After that everything changed. Now you have to do all the research, write the full story and submit it and, if you are very lucky, it is accepted. Admittedly, this is not true for high profile authors but if, like me, you are ‘mid-list’ this is how it seems to be. Post Hachette there were more fruitless years, then a new publisher and four more books; and just when I felt I had got my feet under the table there, the company was bought by a larger publisher, the Young Adult list was axed and all the YA editorial team were out of a job and their writers abandoned. But at least I was not alone on this occasion; there were so many of us that we staged a wonderful party – a wake to mark the burial of the YA list! Since then, I’ve been taken on by a small independent publisher – set up by an editor, as it happens, who was involved in publishing my first novel, so I have come full circle. But who knows where this will lead, how many more books I shall have accepted? There is absolutely no certainly in this game. I’ve been in the business for a long time now and seen a lot of changes. From being nurtured as a newbie, having long and wonderful associations with talented editors, having launches and promotion all done for me by publicity departments, to this new and scary time for writers when editors are either over stretched or inexperienced (or both) and an author is expected to do most of his or her own marketing and publicity. Of course there are authors who actively enjoy putting themselves out there on social media, setting up school visits, turning every possible marketing opportunity to their advantage, but what of those of us who do not? I am essentially a private person, at my happiest being left on my own to research and read, dream up stories to flesh out historical facts and write them as well as I possibly can. I don’t mind sharing my professional life with those who are interested (like you!) but I want to keep my private life private. Of course, I do the social media stuff, but not regularly and usually reluctantly – and I resent its banality. It is not what I am and I don’t really enjoy engaging with total strangers just to blow my own trumpet. And yes, I know I’m missing out in terms of sales – but ideally I’d prefer that my books spoke for me. Back, then, to what I mentioned earlier – to my fascination with Australia’s past. I have spent most of my life living in the UK, so why this urge to write about Australian history? Why does it hold such appeal for me? Well I suspect it is because I came to it afresh when I lived there. In particular, learning about the voyages of the early Dutch mariners, ploughing their way up the coast of Western Australia en route to the East Indies, years before Captain Cook landed on the Eastern side of the country in 1770, and discovering that the first European settlers in Australia were two young men involved in the infamous Batavia mutiny and massacre, marooned on the West Australian coast in 1629. Other shipwrecks followed with more survivors, no trace of whom was found. What happened to these people? Did they integrate with the coastal aboriginal tribes? DNA evidence suggests that they did. There are so many untold stories – extraordinary stories of hardship, endurance and bravery. A rich vein indeed, which I shall continue to tap, whether for my own interest or for a broader audience of young people. Rosemary Hayes was brought up and educated in the UK but has also lived in France, America and Australia. She has written over forty books for children. Her first novel, Race Against Time, was runner-up for the Kathleen Fidler Award and since then many of her books have won, or been shortlisted, for other awards. 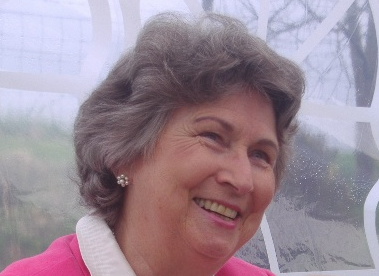 For many years Rosemary was a reader for a well known Authors’ Advisory Service; she now runs creative writing courses and workshops for adults. In October 2016, Rosemary Hayes took part in the 400th anniversary celebrations of the landing of Dirk Hartog at Shark Bay and spoke to school children and other groups in Western Australia about their rich maritime history as well as showcasing a new edition of her book ‘The Blue Eyed Aborigine’, about the Batavia mutineers. 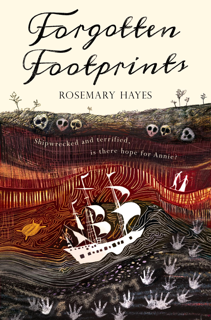 She has recently written another book ‘Forgotten Footprints’ about what might have happened to the survivors of the Zuytdorp shipwreck in 1712. This year is about not forgetting writers who really need to be seen. Some of those writers are still very much among us. The shadows start even when women do their best work. Jennifer Stevenson writes about one such writer. I’m very, very lucky and know both these writers, through Book View Cafe. This means that I can point out an obvious place to check if you want to find out what Jennifer’s talking about or explore Jennifer’s own work. Katharine Eliska Kimbriel has been writing science fiction and fantasy for a long time. Her Nuala novels are among the earliest science fiction romances, delicately romantic compared with the lushly emotional stuff of genre romance, but romances all the same. Her short fantasy stories each visit a single constellation of emotions surrounding a speculative idea, almost surgically. What I’d like to talk about, though, is a set of books I wish desperately had been around when I was eleven years old. The series is commonly referred to after its first volume, Night Calls. Night Calls, Kindred Rites, and Spiral Path follow the adventures of Alfreda Eldonsdottir Sorensson, eleven years old when we first meet her in the Michigan Territory of colonial America. Her parents are land-rich and cash-poor pioneers whose cash crop is fur; they trap responsibly and maintain a positive relationship with Native American tribes in the area. In their tiny village of mostly-Norwegian-descended pioneers, everyone makes what they need or barters for what they can’t make. Persons with extraordinary skills are more valuable than things or money. They get around. Allie’s family are practitioners, that is, gifted with extra-sensory talents that are partly-formally trained but mostly self-trained. Their practice is like everything else they do, built for work, developed under pressure, expedient rather than elegant, and definitely lacking a magickal pedigree. Bits of what we would now call ceremonial magic are mixed with hedgewitchery and a massive amount of pioneer and Native American woodcraft. They do what it takes to get ’er done and never worry about whether they’re qualified. What works, works. The woodcraft is what won me over. My own family’s form of hedgewitchery is founded in German nature-lore, so I was enchanted with Allie’s family tradition of taking the kids out, one at a time as they were deemed sufficiently learned in woodcraft, and leaving them for a space in the wilderness to build shelter, find water, and feed themselves. In the second novel this skill set comes mightily in handy when Allie, fleeing bad guys in the dead of winter through the wilderness, holes up for days in a hidden shelter she builds out of boughs and snow. Every bit of magic is grounded, sometimes literally, in the wilderness surrounding Allie. From the bedrock up to the smallest bird, nature interpenetrates Allie’s magical education. You smell the wet bark, the decaying leaves, the snow—my god the snow, all the books so far take place in deep winter. You feel the sap rising in the tree trunks and hear the chickadee in the darkest woods. Like any pioneer with extraordinary skills, Allie is drafted early into service to her community. At eleven she is apprenticed to a cousin who lives quite far away and serves other wilderness communities as midwife, doctor, psychiatrist, exorcist, and, well, whatever else is required. These novels expand ever-outward, full of episodes and references that seem random until, sometimes late in the series, they resolve into life lessons, valuable alliances, mini-apprenticeships that empower Allie and expand the reach of her responsibilities. This cycle of ever-increasing responsibility, knowledge, understanding, skill, responsibility, friendship with the mere human and alliances with others, and yet more responsibility help protect Allie’s stories from devolving into the sort of high fantasy that never did me any good as a child. Those fantasies, so often about boys, bestowed rewards—wealth, power, and universal adulation—upon the young heroes until they swam in a sea of self-importance. At eleven, the girlchild I was had begun to be aware that these rewards were not meant for me. What seemed real to me at the time was the looming avalanche of responsibility that the world couldn’t wait to dump in my lap. Like the rest of her pioneer family, Allie copes. In her world, nobody over the age of four just cries, waiting for rescue. Allie is confronted by medical emergencies, monsters, and disasters that would take those high-fantasy boy-children two weeks and an army of special friends to handle. Allie assumes she’ll have to do this herself, right now, with whatever tools she can find and allies she can make. And most of the time the adults around her merely shrug and say, Yeah, that works. There’s little to none of the congratulatory ceremony one finds in high fantasy when a boy magician saves the day. Such overpraise seems somehow to diminish that boy’s heroism, while the understated respect Allie wins from her family and from mightier powers has the potency of a journeyman’s nod to an apprentice. The happiest thing about these books is that there will be more. Rumor has it that Kimbriel is at work on more Allie stories. ‘Dorothy Whipple was a popular novelist of the 1930s and 1940s whose prose and content absolutely defeated us.’ Thus Carmen Callil in an article in the Guardian celebrating the Virago 40th anniversary in 2008. My immediate reaction to this was: ‘Have Carmen C and I been reading the same books?’ I couldn’t imagine why she had so taken against a writer whom I admired very much. Was she wrong or was I? In matters of literary taste, there’s no argument you can make to try and win someone over. We all have our blank spots. I, for example, am allergic to Tolkien. But Whipple? I could understand someone saying, ‘She’s not my kind of thing. I don’t like those sorts of books’. But to be ‘absolutely defeated’ by these novels? And to draw the infamous ‘Whipple line’ below which Virago wouldn’t venture? I didn’t get it. My aim here is to persuade others that Whipple, in spite of a name that sounds like a brand of ice-cream dessert, is a writer more than worthy of their attention. I’d say she was astonishingly good and in surprising ways, too. Her novels are also enjoyable and readable. These are not qualities at which readers should scoff and, moreover, they are not to be taken for granted. There are highly esteemed books which are pretty well unreadable. It’s quite a relief to look at the first page of something and know immediately where you are and with whom and when. There’s no scratching of the head and thinking: Who’s saying this? What’s going on? When will things become clear? Dorothy Whipple was not only a popular writer in her day but also a critically acclaimed one. Most of her novels became Book Society Choices and two of them (They Were Sisters and They Knew Mr Knight) were made into movies. Thanks to the admirable Persephone Books, whose beautiful silver-jacketed volumes truly do furnish a room, much of her work is now available. I’m going to discuss several of her novels, but before I do that, let me make some more general points about her work. Whipple is a middle-class writer, and her subject is middle-class families. If you’re looking for deeds of derring-do, non-stop action, wars, thrilling landscapes and adventures; if your taste is for the experimental, the rebellious or the strange and fantastical, you’d be better off trying another writer. Whipple’s stories concern mothers and children, sisters, husbands and wives, and she is very good at delineating other relationships: with in-laws, with servants (and even not very rich people had live-in help in her day) and especially with those who intrude into a household in different ways and somehow wreck the careful balance that has been established there. She loves the daily detail of life: the food, the clothes, the running of a house, be it large or small. She is brilliant when it comes to financial matters, and They Knew Mr Knight has as its subject what happens to a family when money becomes all-important. Each novel has a moral, though it’s never overtly stated. Whipple sometimes uses her own belief in a benevolent God to provide comfort for her characters and an ending that might be deemed less than happy is made to seem better because, we are told, God is taking care of matters. I don’t regard this as any kind of barrier to my enjoyment. Whipple may have an ice-cream name but she is neither sweet nor bland as a writer. Never less than acute, she’s sometimes positively Austen-sharp in her perceptions. She sees right through pretensions and often has a great deal of fun (there’s much to laugh at in even the most serious of her novels) at the expense especially of minor characters. Schoolteachers, neighbours, tradesmen, peripheral men and women on the fringes of the books, are as real as the main protagonists, without toppling over into caricature. I particularly enjoy writers who pay attention to things like dress, jewellery, food, houses and gardens, but do not be alarmed if you think you hate that stuff. Whipple doesn’t go in for long descriptions which tire you out before you’re at the end of a paragraph. Rather, she manages to convey precisely what everything looks like and feels like in the most economical and deft of strokes. Finally (and this is the most important thing of all about any novelist’s work), she makes her main protagonists come to life on the page and engage our emotions. We care deeply what happens to them. Occasionally, when truly ghastly things are going on, it’s very hard to read the words in front of you without holding your breath until matters improve. And sometimes, for some people (these are not cosy books) things get much, much worse. It’s also worth saying that while love is a very important part of Whipple’s subject matter, she is never sentimental and her style, whatever she’s describing, is never overwrought. She’s the least hysterical of writers, but that makes the emotional punch behind her words even stronger. The arrest of her next-door neighbour was a godsend to Mrs. Greene. She was so absolutely in the know. To be able to tell everybody on the way to town, to sit in the café and tell it all over again, to walk home meeting fresh people and tell it again! She was quite exhausted and had to lie down after lunch before going out to tea and telling it again. They Knew Mr Knight is a story rich with event and incident, astute about the effects of poverty and wealth, interesting about what goes on between colleagues and neighbours and outstandingly sensitive in describing the nuances of family life: the problems which actually seem to grow out of the deep love you have for those closest to you. In 1939, Whipple published The Priory. It’s a book in a genre I particularly like: the story of a house, Saunby Priory, and its inhabitants. The lives of the Marwood family, the way they’re bound up with the place, the financial difficulties involved in the upkeep of such a property, the upstairs/downstairs aspects of the story, and what happens to the protagonists, make for the sort of novel where drama and conflict, just because they are set in a reassuring context, might seem less unbearable, and yet the emotional force of every relationship is well-described and dealt with fully. Also, when twins are born to one of the Marwood sisters, we encounter Nurse Pye, a positively Dickensian creation who takes over the household in an almost sinister way. The novel is absorbing and wide-ranging, and particularly good about the problems of adjusting to being a mother for the first time. They Were Sisters first appeared in 1943. Parts of this novel are so harrowing that I found it quite hard to read in places. The story is a simple one. There are three sisters. One (Vera) is unutterably vain and self-absorbed. Another (Lucy) is ‘the good sister’, anxious about the others and always striving to do her best for everyone. She is also the happy sister: happily married and with no children of her own. This makes her the ideal aunt and it’s thanks to her that the young children in the book have any kind of life. The children of the third sister (Charlotte) in particular need shelter and protection because their father, Geoffrey, is one of the most odious, abusive and loathsome men ever to be found within the covers of a novel. There are moments of unspeakable bleakness in this book, but the main thing I will remember it for is Geoffrey, who is a monster in a completely different way from other abusive men you’ve met in fiction. Someone at a Distance (1953) is my favourite of Whipple’s novels. It’s a story about an English family: Avery and Ellen North and their children, Hugh and Anne. Avery’s mother hires a French companion called Louise Lanier and she acts as a kind of serpent in this Garden of Eden. It’s another book where you want at various times to shout out to the characters: Oh, don’t do that. Can’t you see what the consequence of that will be? Why won’t you listen to him? Why don’t you say something, etc. And yet Whipple has such control over her story, over her characters, that you are drawn along, deeply involved with everyone, even the detestable Louise. She is a magnificent creation and in this book Whipple does a really good job of describing French life as well. Having the book set in two places gives it its title. ‘Someone at a distance’ refers to Paul, Louise’s ex-boyfriend. He scorned her while she was still in France and everything that happens in the novel is as a result of her trying to punish him for his behaviour. The Norths are simply pawns in her extended and unpleasant game. It’s a terrific book, full of anguish, passion, jealousy and remorse.’Proper people in interesting situations’ is one definition of a good novel. I think that Whipple’s books are precisely that. If Carmen Callil is of the opinion that they are no more than women’s magazine fiction writ large, I think she’s mistaken. Do try these novels and see what you think. I’m willing to bet you’ll agree with me. I know Adele through The History Girls. I’ve admired her works for such a long time and was delighted to find her also talking hsitory. That’s why I asked her here – she walks the talk, and the talk is beautiful. She offered me a rerpint for this celebration and it was so perfect, I said ‘yes’ for the writers of everyday life show so many wonders, and Adele explains why. This opens up Dorothy Whipple’s books, but also many others. This article first appeared in a magazine called “Slightly Foxed” in 2005. I knew Sharyn first as a science fiction fan, an editor, and as a writer. She edited Life Through Cellophane (now Ms Cellophane) and a short storyof mine. I asked Sharyn for this, then, for the world is full of incipient irony, I was raced off to hospital myself. Most of this month will be writers talking about writers, but it’s important to see, sometimes, what lies beneath the surface. Some lives look as if their owner’s swimming upwater through shoals of pirhanas. It’s important to know this, that some of the prices paid are hidden. When we see the work of writers, this month, it’s worth keeping in mind the prices that some have paid. It’s another hidden element of history. Gillian asked me a doozy this year. Ask me to tell you about Australia’s female bushrangers, and I can reel their stories off pat. Ask me about the Australian suffragette movement and I’ll not only tell tell you about Edith Cowan (who in 1921 became our first elected female politician) but also about the women before her, like Vida Goldstein, who ran for the Senate on three separate occasions (1903, 1910, and 1917) but – that’s not what Gillian asked me. She wanted me to talk about me. Not about my experiences as a woman in fandom in more recent history (rural Australia of the 70’s and 80’s) But about how I write under interesting circumstances. She thinks I might have some pointers for others. Maybe she’s right, we’re about to find out. I’ve been stumped on how to approach this all month long. Then this morning two things happened. I read a quote about if all the people with rare, chronic illnesses were all put into one country, we’d be the third most populated country in the world. Our conditions might be different, but there are a lot of us, and we all deal with intriguing amounts of pain on a daily level. The second thing that happened was my dog tripping me over. Today: cartilage either side of sternum is inflamed, One shoulder is frozen, the other has multiple tears from joint through cartilage. Spine is degrading at base of skull and lower back region. Arthritis through shoulders and full length of spine, and sciatic nerves are not being friendly today. The idiot hound tripped me up as I stepped down off the back verandah, and I landed awkwardly on the concrete, grazing my knees and hands. I sat there for a few moments, trying to work out which part of the body I could move first, in order to stand up. The idiot hound just looked at me like “What are you doing? Why are you sitting on the ground?” *sighs* No, I didn’t kill him, but today is going to need coffee. Lots and lots of coffee. Then I opened up my current manuscript, looked over at my notes on my cork-board, and wrote another thousand words. Every time I felt my brain getting foggy, all I have to do is sit back, and I’m looking at my notes. I know there are all sorts of writing programs and apps to help authors keep their research altogether. And when I am specifically looking for something, those are great time savers. But those times when brain fog sets in and I don’t have the wit to open up anything, sitting back and staring at hand written pages until the words start to make sense, is the one method I can utilise to keep me writing. Having a publisher who is absolutely understanding, and allowing me to work at the best pace I can, is an incredible blessing. I think this is where small press can shine. I am beyond grateful that Snapping Turtle Books took my Y.A. science fiction series, and me, on for the long haul. My other recommendation for trying to write, deal with family and real life stuff, when every muscle in your body feels like it’s on fire, and you could sleep for a week, except if you did, you’d only wake up tired, and you’d be even more behind: Laughter. It’s easy to do the “Oh poor me, I’m in pain” routine. It’s a lot better to find something to laugh at. 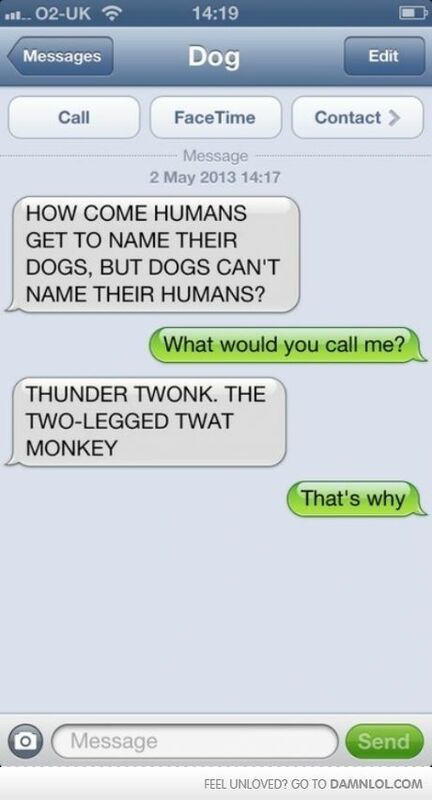 Hunt down some old Damn You Autocorrect entries, or Texts From Dog, like this one; laugh and get back to work. This year is celebratory, I’ve decided. Things are so very tough for so many people I know (including myself!) that I want a small time out from dealing with life and a month spent enjoying the wonder. Initially, i was going to start this in February and give you the Women’s History Month I failed to deliver on last year because life was just a little too exciting. Merely. Barely. But then I started writing a novel while doing quite possibly too much else. Until now I’ve had the luxury of writing novels in the interstices. Even the novel full of chocolate and sarcasm and sheer rage from last year (which will be published in a year) was written when a lot of my teaching faded from view. This time, though, I’m doing everything at once. I had twenty deadlines of various sorts this week, and I should meet them all by working nice long days, but… this meant I had to rethink. My celebration has a main theme, which is writers telling us about other writers who are flying under the radar and ought not be. It also has occasional posts on other women’s history subjects. I have some wonderful posts because my strict rule is to ask people whose work is also worth reading. Whatever these friends are writing on, they have voices worth hearing. I’m so glad to be so much past the worst of a very challenging period, and to be able to be part of Women’s History Month again. One day, the Australian celebrations will mention those of us who started the ball rolling. I worked with a writer over summer and they had trouble understanding that one of the biggest chains on positive cultural change – to do with many histories, including those of women and minority groups – is the tendency for the wider community to forget and to silence. My celebration is another way, a happy way, of working to bring back many voices and to start conversations. We don’t have to accept the silencing being thrust on us. This year I’m littering the internet with presents rather than keeping them all in one spot. The first for you here, on my home site, was the questions offer. The second, is a picture. This is my answer to the much-asked question “What do Belinda’s feminist biscuits look like, in The Wizardry of Jewish Women?” Seriously. I get this question time after time. All the serious stuff is “Yeah, we got that,” but the biscuits are a major concern. They’re straightforward biscuits, suitable to go with a cuppa, and they’re swirled with purple and green. Have I ever made these biscuits for feminists? Of course I have.